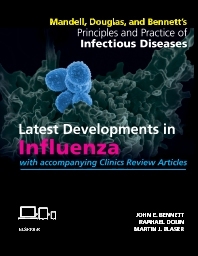 Mandell, Douglas, and Bennett's Principles and Practice of Infectious Diseases: Latest Developments in Influenza with accompanying Clinics Review Articles details the newest late-breaking approvals, recommendations, and key content on the treatment of influenza in a convenient eBook-only format. Brought to you by the expert editor team from Principles and Practice of Infectious Diseases, it provides the most current research and findings related to the ever-changing area of influenza study. In addition to this extended content, you'll also receive three accompanying Clinics Review Articles for further information on antiviral resistance, allergies to influenza treatments, and rapid diagnosis. Includes information on the approval of peramivir, the first intravenous antiviral for use in treating the influenza infection in adults. Highlights the most up-to-date recommendations for vaccine usage. Discusses the approval of new rapid influenza diagnostic tests. Details the lack of efficacy of the influenza vaccine in the 2014-2015 flu seasons. Includes three Clinics Review Articles: Antiviral Resistance in Influenza Viruses; Drug and Vaccine Allergy; Rapid Diagnosis of Influenza: State of the Art. Latest Developments from Mandell, Douglas and Bennett's…..